Gemstone engagement rings have exploded in popularity thanks to millennials who seek nontraditional bridal jewelry. According to Brides, millennials are choosing to stash their cash for major milestones like a house, children, or even a dream honeymoon. By swapping diamonds for colorful statement stones, couples are saving money and creating ring designs that reflect individual style and personality. 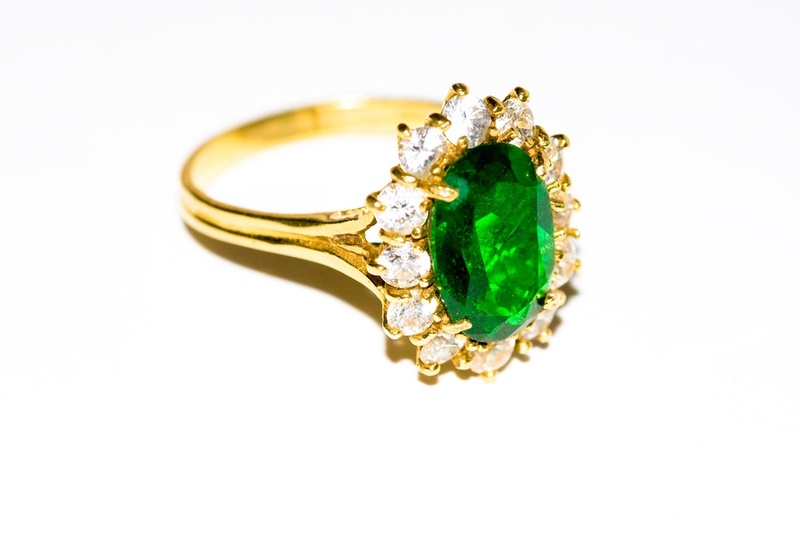 One of the most popular gemstones for colorful engagement rings is the glorious green emerald. 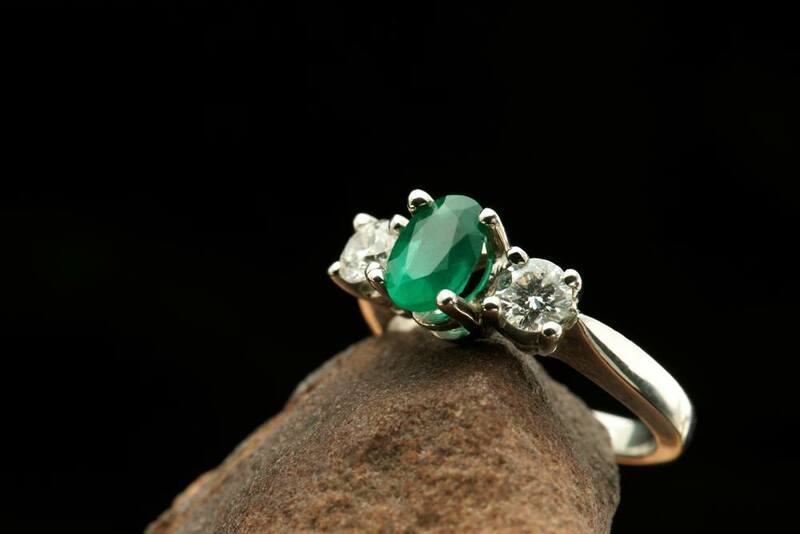 As one of the more durable gemstones, emeralds are an ideal stone choice for an engagement ring. And the deep green hue of the gem looks elegant in both warm- and cool-toned metals. Much like diamonds, emeralds come in many shapes and styles, the most popular of which is the emerald cut, invented for the emerald gemstone in particular. However, more modern brides are putting a twist on this classic style by instead choosing round-cut emerald gems. Looking for the best round-cut emerald ring? Choose one of the following dazzling settings to allow that green glamour to pop on your hand. Call it the Kate Effect — as in Duchess Kate — but gemstones surrounded by diamond halos are beyond luxe. A round emerald encircled with a crown of diamonds grabs the eye and creates a magnificent focal point on the hand. Feel free to choose a smaller emerald, as the surrounding halo diamonds add to the weightiness of the ring. For brides who want a more traditional look, pair a diamond with a gemstone halo. Small round-cut emeralds around a brilliant center stone make for a creative and vibrant pop of color. 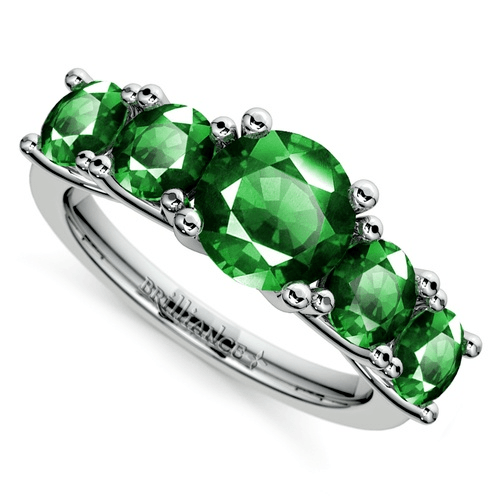 The round emerald can stand alone as a solitaire style. Choose platinum for a sleek, silver-hued contrast or yellow gold to add warmth. Etchings on the band, like on this antique floral setting, add dimension without stealing the focus from the gemstone. 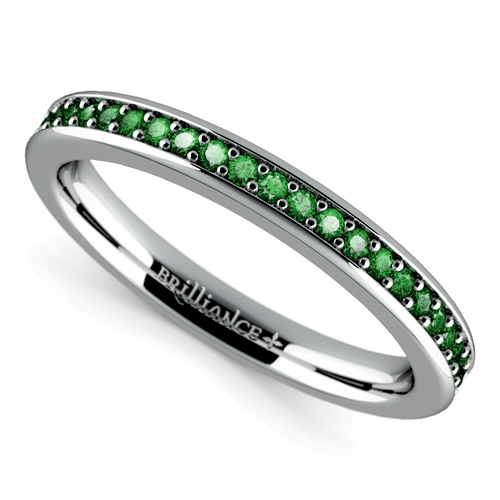 Your friends will be green with envy when they see your pave-set emerald ring. A seamless line of round-cut emeralds is delicate in size and bold. You can also alternate between diamonds and emeralds. Because it has no center stone, a pave ring makes a great wedding ring or anniversary gift to be paired with an engagement ring. Design a ring that features a round-cut emerald hugged by diamonds. Select round brilliant diamonds as side stones to add a burst of fire to the more muted emerald. Pear-shaped diamonds create a shapely contrast with a round-cut emerald. Diamonds with larger carat weights add drama to a ring, while daintier diamonds create whimsical accents. Design a five-stone engagement ring with a mix of round diamonds and emeralds in a trellis setting. This ring may be paired with a plain wedding band or worn alone. The design also creates a wonderful anniversary ring or vow-renewal setting. 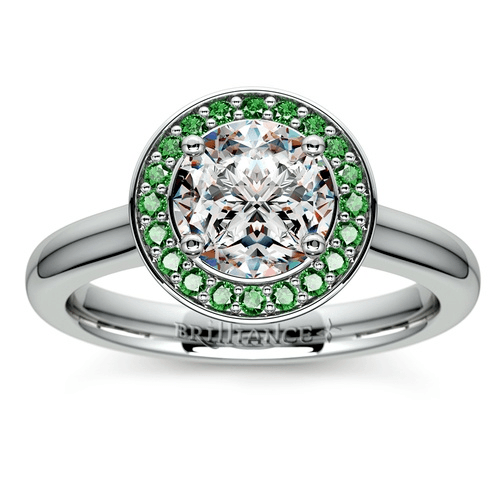 Of course, the ring may also be set with a solid row of emeralds for a gorgeous green glow! If you’re going with an unconventional round-cut emerald for your engagement ring, you need a setting as unique as you are. Why not go completely custom? Technology has made customizing your own engagement ring easier and more affordable than ever. At Brilliance, we can create any design your heart desires. From beautiful gemstone rings to intricate, sculptural designs, we’ll make your round-cut emerald a star. With Brilliance, no matter how you set a round emerald, it is guaranteed to dazzle!